They have such a cute little face and you'll love their darling waddle! These adorable little critters make the perfect apartment pet. Hedgehogs are a very quiet, small friend and are not aggressive as long as you hold them regularly. This makes them a great choice for both adults and older children. They virtually fit in the palm of your hand! Most people have no allergic reactions to hedgehogs. They have virtually no odor, are clean, and can be litter box trained. If you want a small pet but with a longer life span than say, a hamster, a hedgehog is definitely the pet for you! Being basically a solitary animal, Hedgehogs don't mind being left alone for long periods of time, especially during the day. They get active in the evening and that's when you are more likely to be home to enjoy them. Yes, they make the perfect apartment pet! There is also a European Hedgehog, Erinaceus, that is larger than its African cousin. It grows to about 12 inches long and weighs about 3 pounds. The European Hedgehogs are now protected in their native countries but were well liked by European gardeners, as they would eat up to a third of their weight in slugs, snails and insects in a single day! Background: Hedgehogs inhabited the earth even during the time of dinosaurs, making the Erinaceidae family the oldest living insectivore! In the wild these animals are found in Europe, Asia and Africa. They are not native to the United States and can no longer be imported, but many African hedgehogs are bred here. 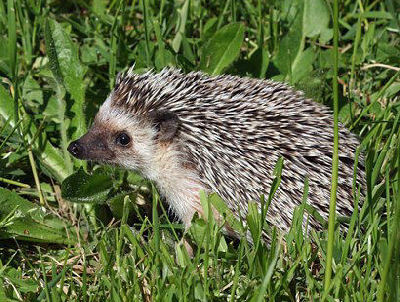 Importation of the African Hedgehog was banned in 1990. In 1992 the North American Hedgehog Association (NAHA) was formed by fanciers dedicated to the health, happiness and successful breeding of this cute little creature. Description: The African Pygmy Hedgehog, African Hedgehog, or Pruner's Hedgehog grows between 6.7 and 9.5 inches (17-24cm). They generally live four to six years, but have been known to live up to nine or 10 years in captivity. This hedgehog is a small mammal about the size of a guinea pig. They have a long pointy snout, large eyes and ears, four digits on each foot and a short tail. They have soft white to dark brown or even black fur covering their face and under parts. Their coloring varies from black to white to gray and they have white-tipped spines or quills covering the top of their head, their back and their sides. With captive breeding quite a variety of quill colors and patterns have been developed. Some of these are chocolate, panda, snowflake, cinnamon, fawn, mocha, cream, smoke, albino and various patterning including spotted, large spot areas, and striped areas. Though they are not related to porcupines, they also use their quills for defense. Their natural defense when alarmed is to become a prickly little ball. They roll up into a tight circle with their quills pointing outward in all directions. A tame "socialized" hedgehog will rarely erect its quills. Another trait of this hedgehog is called "self-anointing" or "anting". This is caused by new or unusual scents on an object, After chewing or licking the object, they will foam at the mouth, producing lots of frothy saliva. Environment: An indoor rabbit cage or hutch makes a perfect hedgehog home. The cage should be a type that does not have a wire bottom. (Also make sure you do not provide any toys that contain wire as it can be hazardous to hedgehogs). Keep the cage in a draft free place with a constant temperature between 60 to 80 degrees, for non-hibernating hedgehogs the temperature should be kept above 72 degrees. If the temperature fluctuates and it becomes cold, the hedgehog will become inactive and sleepy. The cage should be large enough to put in a little sleeping hut or burrow for the animals privacy and still leaves a little space for running around in. A wooden bird nesting box will work great as a sleeping hut. Use natural bedding on the floor of the cage to absorb waste. Hedgehogs are naturally clean animals and can become litter box trained. You can provide a small litter box away from food and sleeping areas with a pelleted litter or recycled paper. It is best to avoid clumping or clay type kitty litters. Remove the animal waste everyday. Once a week change the bedding, the litter box, and disinfect the cage with bleach, rinsing it well. Care and feeding: Use a crock for its food, as crocks are difficult to knock over and spill and they are hard to chew. Because they are insectivores they will like worms, mealworms, waxworms, crickets, slugs, snails, bugs, moths, spiders, pinkies and baby frogs. Even though they are classed as insectivores, these hedgehogs are opportunistic eaters with a healthy appetite and especially like foods they can hold and crush. Offer a commercially prepared hedgehog food, if that is not available you can offer them a dry cat food that is high in meat or poultry. They will also eat small amounts of vegetables and have been know to like an occasional bit of apple. Provide a water bottle with fresh water daily. Activities - Exercise and Play: Hedgehogs are nocturnal little critters, meaning they will sleep all day and get be active during the night. This is when they will love a wheel to run on. For exercise they can use a guinea pig wheel. To offer a little more adventure, think about getting a guinea pig ball. This offers your little pet an opportunity to run around a room without getting loose or getting hurt. Hedgehogs can get lots of enjoyment out of pushing balls or other toys around. They also like to climb and explore tunnels. Many cat, hamster, and ferret toys are great for hedgehogs and are readily available at pet stores. Dr. Jungles says...."the cutest things come in small packages!" "Sonic is a salt and pepper african pygmy hedgehog :) He is about 6 ounces, slightly small (not underweight!) for one of his species. He loves to pose for pictures, and almost never bites or spikes, AND he has been to school!...Sarah"
Social Behaviors: In their natural habitat the African Pygmy Hedgehog does not exhibit aggressive behavior, but is solitary except during their brief mating period. It is best to keep individuals separate in captivity. Males will often fight, though two females can be house together as long as there is plenty of room and they have separate sleeping places. To most household pets a hedgehog is considered prey, so be sure to keep them well out of the reach of any other pets. Handling and Training: Although not a social animal in the wild, hedgehogs will respond positively to quiet handling and touching, being talked to and getting attention. They do need alone time and do not like to be disturbed during the day when they are sleeping. Some will be grumpy if bothered. It is best to interact with your pet in the evening when it is awake. Most hedgehogs will accept handling, but will not come looking for it. Pick up your pet up by gently scooping him up underneath along his sides, then you can either hold him in the palm of your hand or set him gently on your forearm. A relaxed hedgehog will come out of his ball, but they can stay in a ball for hours at a time. Regular handling and offering treats will help to relax your pet. A tame "socialized" hedgehog will rarely erect its quills and will generally accept handling from anyone. Breeding/Reproduction: The breeding period in the wild is October to March. These animals are sexually mature at about eight to ten weeks, with a gestation period of 32-36 days and a litter of four to five though they can have up to ten. Diarrhea and vomiting: If your hedgehog is experiencing either of these, remove all foods and offer only a small amount of water. If the symptoms do not clear up or it is severe, you will need to take him to a veterinarian. Mange: This is probably the most common reason a hedgehog is taken to see a veterinarian. Signs of a problem are heavy flaking, scabs or redness, loss of hair or quills, crusted ears, or swollen crusted feet. This is generally caused by a microscopic mite and you should take your pet to a veterinarian for treatment. Ringworm: A fungal disease of the skin, it looks similar to mange mites, but the hedgehog is not itchy. You should take your pet to a veterinarian for treatment. Fleas, ticks, maggots: Generally dirty conditions may provide breeding places for these types of pests so make sure and provide a dry, clean environment. A tick can be removed by firmly grasping it with tweezers as close to the skin as possible and pulling it out. Then clean the area with a skin disinfectant. Fleas can be eradicated with use of a mild flea shampoo that is safe for cats. A thorough cleaning and disinfecting of the cage is also necessary. Maggots are a fly larvae and are rarer, but can cause significant skin damage. Some can be removed with a good bath and then a rinse in hydrogen peroxide and rinsed again, but some burrow too deep and need a veterinarians attention to eradicate them. Respiratory illness: Signs of this are nasal discharge, loss of appetite, difficulty breathing, and loss of energy. This is often caused by being too cold, a poor diet, or a dirty environment. Respiratory disease can quickly turn into pneumonia so it is important to see a veterinarian as quickly as possibly. Shock: If your hedgehog is weak or unable to move it may be experiencing shock. Handle him as little as possible take him to a veterinarian. Low body temperature: Sometimes your hedgehog will get sluggish if the temperature of its environment is too extreme. Hedgehogs will go into a period of rest or hibernation if they get to cold, and will also aestivate if they get too hot. Adjust the temperature to a more comfortable level. Availability/Purchasing your Hedgehog: The African Hedgehog, African Pygmy Hedgehog, or Pruner's Hedgehog is the most readily available; with the European Hedgehog being much more rare. This animal is available in most states, with the exception of California and Arizona. You may have to have a permit in some areas. Your best bet is to look for one at your local pet store, they can tell you what the legalities in your area are, or check with your local animal control officer. When buying your hedgehog check its eyes, ears, nose, feet, fur, and the skin between the quills to make sure they are healthy and clean looking. Overall you should not see any sign of injury such as limping, no excessive scratching, and no undue wheezing or coughing. We have hedgehogs for sale and can arrange transportation for out of state homes! You can set up appointment to pick yours out in person. Babies posted are weaned and READY NOW! All of our baby hedgehogs are handled from 3 weeks old to ensure they are friendly and confident in their new homes. We feed on a varied diet to ensure healthy hedgehogs and to avoid picky eaters. We produce a variety of colors plus split face, odd ears, odd eyes ect. We currently have 8 week old males and females available in store ready for their forever homes.